My inspiration for today’s I Love to Create column comes from two places. First there were the iron-on’s by Chronicle Books. Adorable illustrations by Mike Perry and Sukie of kittens on mopeds and football helmets with skulls. The books sat mockingly on my shelf never getting used except at the occasional onesie making baby shower. 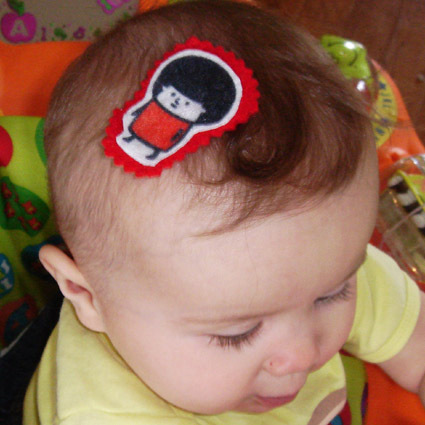 Recently while looking for the perfect hair clip I came across a barrette I bought at Maker Faire last year. I’m embarrassed to say I don’t know who made the cute little owl on felt, but I adore him nonetheless. The owl is a stamp on felt which got me to thinking: if you can stamp on felt, why couldn’t you iron on it? I plugged in my iron for the first time in God knows how long, drug out stacks of stiffened craft felt and got busy. 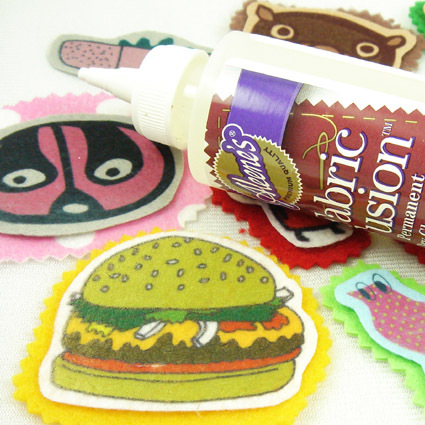 The iron-on transfers actually were more vibrant on the felt than they ever were on clothing. I was on to something good. The first thing I did was to choose a few of my favorite motifs from the books. Luckily lots of the illustrations are small and some even come in pairs, just right for a set of hair clips. Following the instructions for the fabric transfers I ironed the images onto different color pieces of craft felt. I tried to use the pre-stiffened kind when I could. I love layering color so I added a second piece of felt which I cut out with pinking shears for a decorative edge. Using my Fabric Fusion glue I stuck the two coordinating pieces together and waited anxiously for them to dry. Once the two pieces of felt were stuck together I had to decide which pieces were going to be barrettes, pins or necklaces. Rings and Things has an amazing selection of hairclips, pins and jewelry parts. For the pieces being made into pins and hair clips I attached the felt to a blank using Liquid Fusion Glue. Once I got started, I found it hard to stop ironing. 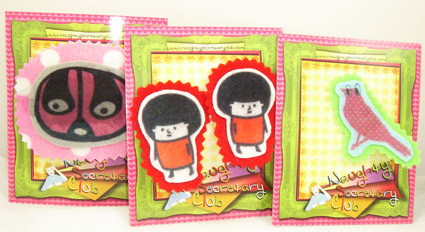 For the larger designs I ironed and layered just as I had with the hair clips. I used my Crop-o-Dile and some eyelets to make holes in the felt. I attached a chain using jump rings and my necklace was born. 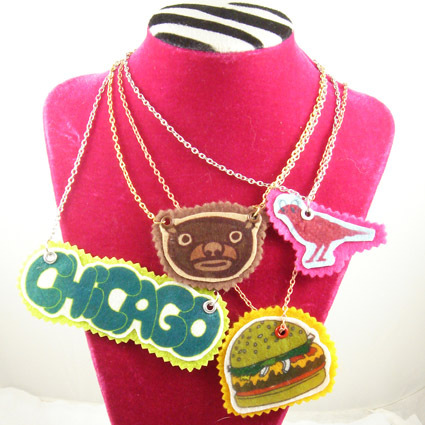 Since the craft felt was stiff the necklaces keep their shape. 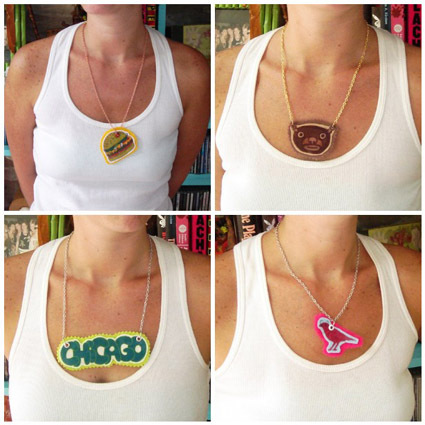 Nothing is safe from my jewelry making ways, not even iron on transfers! Posted September 17, 2009 & filed under Art, Books, I Love to Create, Wearable Crafts. These are freakin' awesome! Go Jen! I Love love these! Perfect for early holiday gift making! Sweet! 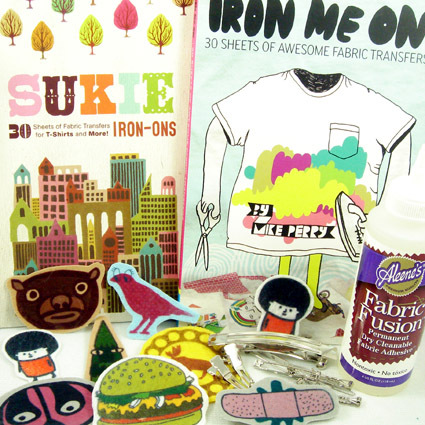 I got the Sukie transfers this summer as a super-cool birthday gift and this is such a great project idea. Thank you, Jennifer! I'm telling you if it will sit still long enough I will find a way to make it into jewelry, I don't care what it was intended to be. I was glad to find a way to use the transfers sine I had a bit of trouble with them washing out I thought why not use them on something that does not get washed. The graphics in both books are so rad. As always, a kickin' idea!! How cool! The transfers do look more vibrant on the felt. I have a bunch of tee shirt transfer paper and have been looking for a better way to use it. Like you said, they tend to wash out of tee shirts.